Here's a complete analysis of different types of blogging layouts. Each and every layout has some advantages and some disadvantages. 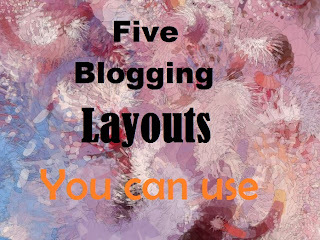 The article clearly explains the psychological aspects of blogging layouts adopted by leading websites. The following are examples from some of the best websites in their field. One of the most popular Bloggers in his Genre, Amit Agrawal from Labnol uses a unique style to present his articles. The first thing which comes to front is a large fonted title text which I must admit does not give a lot of information on the text or the main article beneath but is an eye catcher. The thing unique about the style is the second portion. Now everybody knows that google listings show a brief description of the link below, that is with the help of meta description tag. AmitAgrawal uses this knowledge to his advantage by adding a portion of text just below the main title, this text is a description of the article below. So the user sees the initial description in the google listings and since there is no ambiguity in that portion, the user gets what he/she wants. So the user is satisfied and stays longer at the website, leading to chances of advertisement clicks or to some internal links. The third portion consists of an attractive image, which necessarily summarizes the premise and lets the user wanting for more. Fourth comes the main text, which the user has been dying to read just because he/she’s been appetised much. All that leads to higher value of your article in the eyes of the reader. More value will give him incentives to click on subscribe button which ultimately leads to higher PageRank with higher Visitors. The Sitepronews way of displaying articles is that of a well-seasoned boxer. Sitepronews just bombards the user with huge amount of information and image. The point when the website loads, the user feels like a bomb just went off. Such huge information at a place all condensed together bundled in neat packages make it looks more authentic and journal like. Unlike Labnol the title text is normal fonted and every article comes with a standard image telling the user what genre the article falls in, like in the above case it is pretty clear to every one that it’s an exclusive article written by one of the founders itself. One look at the layout and you can tell that the official social network handler for the website is twitter and others are just for the name of it. Just like Labnol the website also offers a small description of the article below so that the description is displayed in the google listings and the users get what they see. Then comes the actual article. Now SPN has chopped up the article in small pieces so that if at some point of time the user ends up yawning, he can skip forward to the piece of article in bold. This helps the user to stay on the website for longer. Technorati on the other hand has a very simple and unassuming attitude about their layout. The only thing different than that of other blogs is that brandishes a very catchy title on the top. Even though, they do not take the pain of explaining the title below, they manage to pull it off pretty well in their main article. Again the thing complementing the article is an expertly photoshopped picture of the entity in question. The only difference of this image is that most blogs keep their photo or images aligned to the left but Technorati aligns it to the right. Talking about the article, it is the same old juicy text with lots of very dense information holed up at every step you go. Though webpronews is not an internet blog by itself, the website can be considered well within our range of layouts because of its original style. Webpronews, a website that is considered to be the newspaper of everything happening around the world. Its topics ranged from technology to arts, from sciences to web tools etc. The original thing about the webpronews way of setting its layout is that it is very subscriber intensive. If a user comes to the website and does not subscribe to the posts, it is considered to be a very serious condition. The article page brandishes a very large fonted title with a small subtitle line below it (just like a newspaper). The subscriber magnet just below the article titles. Then comes the sharing platform, where the user is supposed to like, +1, tweet or Pin it. Advertisements are still kept at bay not interfering with the actual text enabling the user to find what he/she was looking for without the constant interference from the advertisements. Though it reduces the earning but a large website can afford that. Then comes the article with a hi-def. picture on the right hand side (sometimes it’s on the left) and the article wrapped around it. The codemakit style of arranging the article on its website is a combination of all types. The only difference is that though it contains the title text as a medium to normal but in uppercase (i.e. Capital Letters) Now text might look a bit small but the effect is then compensated by the letter and line spacing, giving the article a fuller look. Now the article does not have a sub description but it does have a prequel resembling paragraph showing what is being told in the lower lines. The particular paragraph is always colored green as color coding and usually describes the article within 2 to 3 lines. This helps the user to be ready for what comes in the article. Before the main text one thing to discuss is the image found at the left of the article, this image is always present in every article and carefully and cleverly displays the main topic of the discussion or a friendly pun or a cartoon to attract the reader. Then comes the witty article written with subsequent breaks and peppered with images from Chalk Dudes and step by step tutorial images. If the article is from a research post from codemakit research division then its image too is displayed. Finally the article is then ended with a bang with the title displayed in its official font MohitChar, reminding the readers what were they looking for and incentivizing the thought process to check if they found what they were looking for. After that come the related labels to help users move through the article. After that comes the social networking buttons to help them share the article making it more popular.